Al Jazeera America has parted ways with another top female executive, the latest in a string of high-profile departures this year at the struggling news channel. AJAM confirmed that Mary Caraccioli is no longer serving as the channel's senior vice president of news output. Caraccioli is the fifth high-ranking woman to leave AJAM in recent months. "AJAM continues to realign its editorial and business operations to best position the network to advance its core journalistic mission," the channel said in a statement. "We thank Mary for her work and dedication, and wish her the best in her future endeavors." An AJAM spokesperson declined to provide a reason for her departure, citing a policy to not comment on personnel matters. Caraccioli, a veteran news producer who previously worked at CNBC, did not respond to a request for comment. Her biography remained on AJAM's website on Thursday, and just a couple weeks ago she contributed to a report from Havana on the flag-raising ceremony at the newly reopened U.S. Embassy. Caraccioli mentioned the channel's broadcast from Cuba in her farewell message to colleagues on Tuesday. "From the team beside me in the control room the day we brought the network's first live broadcast on the air to the crew in the field for our first live international broadcast 10 days ago in Cuba - it has been an honor to stand shoulder to shoulder with you," Caraccioli wrote in an email obtained by CNNMoney. 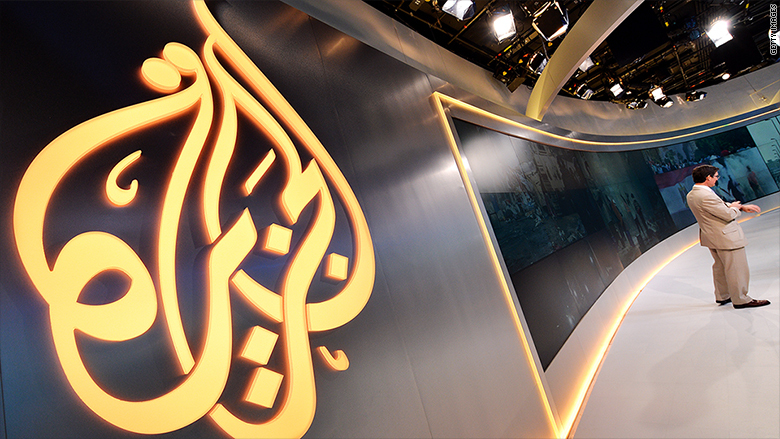 "While I am sorry I will not be a part of this next phase for AJAM, I'm sure you will all make me proud." The channel, owned by the Qatar-based Al Jazeera Media Network, launched with great fanfare two years ago under a mission to focus on hard-nosed journalism. But so far, AJAM's struggles have gotten more attention than its news coverage. Beset by low ratings, the channel has been rife with internal drama this year. Other female executives who left AJAM before Caraccioli have taken legal action and sharply criticized the channel's top brass. Shannon High-Bassalik was fired as AJAM's senior vice president of programming and documentaries in February, prompting a multi-million dollar lawsuit against the channel and its former CEO, Ehab Al Shihabi. In the spring, AJAM lost a trio of female executives in quick succession, as executive vice president for human resources Diana Lee, executive vice president for communications Dawn Bridges and senior vice president of outreach Marcy McGinnis all resigned in the span of a week. Following her resignation, McGinnis told the New York Times that Al Shihabi promoted a "culture of fear" at AJAM. Al Shihabi was replaced as CEO in May. AJAM's new CEO, Al Anstey, commemorated the channel's second anniversary last week with a video message to staff in which he acknowledged that employees have "been through a period of great change" and that there have been "some tough times" at the channel. "We've faced a number of challenges, but now we're looking to the future together," Anstey said.